More Smart & Final locations have begun same-day online grocery delivery through Instacart. The companies said Tuesday that 27 Smart & Final banner stores are now offering home delivery of groceries, fresh produce and club-size items via Instacart — in as soon as two hours or less — in the California markets of Baldwin Park, Carmichael, Citrus Heights, Coachella, Covina, Fountain Valley, Gardena, Highland Park, Laguna Niguel, Los Angeles, San Diego, San Dimas, San Jose, Santa Ana, Santa Clara, Stanton, Sunnyvale and Whittier. With the expansion, Instacart-powered grocery delivery is available at more than 90% of Smart & Final stores in California. Smart & Final and Instacart began piloting same-day delivery in March 2015 and then kicked off a broader rollout of the service in August 2017. The latter included the launch of the branded Shop.SmartAndFinal.com site in Instacart’s online marketplace and expanded availability of home delivery to about half of the chain’s stores. 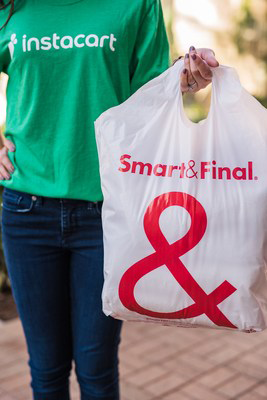 Commerce, Calif.-based Smart & Final operates 322 grocery and foodservice stores in California, Oregon, Washington, Arizona, Nevada, Idaho, Montana and Utah. That includes 258 stores under the Smart & Final Extra! and Smart & Final banners and 64 warehouse stores under the Smart Foodservice banner. Through a joint venture, the retailer also operates 15 stores in northwestern Mexico.